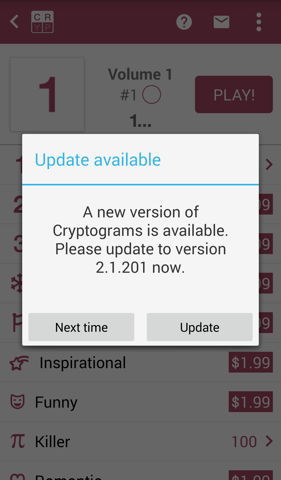 Notify users when a new version of your Android app is available, and prompt them with the Play Store link. Siren checks a user's currently installed version of your Android app against the latest version information stored in a JSON file on a server URL you provide. (Unfortunately, the Google public API for version checking requires a token, and due to logistics and rate limiting, it's not feasible to use the API from an Android app). A minimal usage is to add the following to the onCreate of your main activity. This will check at most once a day for a new version and give the user the option to choose "Update" or "Next time". Host a Json document with a public access that will describe your application package name and current application version. minVersionName: The minimum version name required. minVersionCode: The minimum version code required, minVersionName will take precendence if both specified. enable: A boolean flag to remotely toggle the version check feature. force: A boolean flag to remotely set alertType as FORCE on every type of update. The SirenVersionCheckType controls how often the server is checked for a new version, and hence how often the user will be prompted. You can set it to IMMEDIATELY, DAILY or WEEKLY. You can also define the dialog appearance and behaviour by setting SirenAlertType to react according to your version increment per Semantic Versioning. The default is SirenAlertType.OPTION. This generates a 2 button "Next Time" or "Update" alert. Other values are FORCE, SKIP and NONE. NONE will not display an alert, but will call your listener with appropriate text to display. See Example below. You can combine these options to have different behaviour for different version changes. 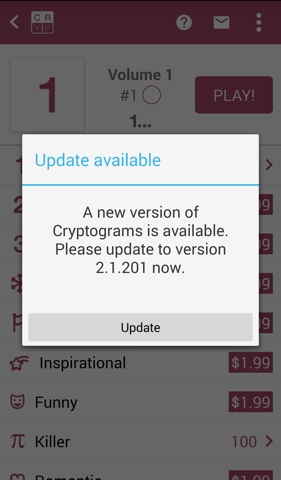 For example, you might will force a user to upgrade for a major version change (e.g. 1.x.x to 2.x.x), give them a "Next time" option for a minor version change (e.g. 1.2.x to 1.3.x) and add a 3rd "Skip this version" option for a 3rd or 4th level change (e.g. 1.2.5 to 1.2.6). As well as the levels: Major, Minor, Patch and Revision, you can also set messages based on the versionCode of your app by using a minVersionCode field instead of minVersionName. Some developers may want to display a less obtrusive custom interface, like a banner or small icon. 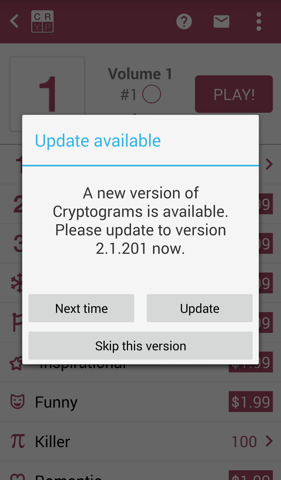 You may also wish to control which level of update to force a user to update vs deferring to later. You can find a fully functional sample project at https://github.com/eggheadgames/SirenSample. Siren is localized for Arabic, Armenian, Basque, Chinese (Simplified), Chinese (Traditional), Danish, Dutch, English, Estonian, French, German, Greek, Hebrew, Hungarian, Italian, Japanese, Korean, Latvian, Lithuanian, Malay, Polish, Portuguese (Brazil), Portuguese (Portugal), Russian, Slovenian, Swedish, Spanish, Thai, and Turkish. Change the url in your app to point to a test location (e.g. http://myjson.com/ is a convenient test site). Create an appropriate file and run your app with the temporary url. Running this should show an update dialog when I start the app. Of course using a value other than IMMEDIATELY may not bring an immediate prompt, unless your SharedPreferences are being deleted between attempts.